ML has been ported to 5D and 40D but there seems to be lack of activity for XSi, which I believed Canon should have sold quite a lot. Yep, you are right, I have one. But I am looking at this porting thing not as an ML user but as an ML developer. For the past couple of weeks I have roamed this website and CHDK in an effort to understand what this "hacking" business is all about and to size up the development work. Well, it is big, at least to me. As someone who doesn't do video, I am wondering if it is worth the effort for me to jump in. From the information I came across it seems that firmware dump, v1.0.9 has been available (http://chdk.setepontos.com/index.php?topic=3402.0) but a later thread asking for help to dump the same firmware (http://chdk.setepontos.com/index.php?topic=4973.0) while using the same file I/O function pointers. Intrigued by this and as an IDA learning exercise (new tool to me), I set out to find what is going on. Well, I found the correct pointer values for those file I/O functions in Canon's flasher code and they are the same for both v1.0.9 and v1.1.0. Hmm, I wonder how one could get the firmware from apparently wrong function pointers. No, I have not dumped anything yet (need to set up the build environment in Ubuntu first, not to mention the build scripts) but I am sure mine are correct because I have cross-checked with those known working pointers in 40D firmware dump code in this thread (http://chdk.setepontos.com/index.php?topic=1651.45 to make sure they executes the same flasher file I/O code and they do. As a matter of fact, XS (1000D) has the exact same flasher file I/O code. They are just in different places (pointer values). I have not decided whether to continue further and certainly will not in the next two/three months but if anyone is interested in porting, I have no problem published the correct pointer values. Just want to get this porting thing move forward, albeit tortoise-wise. I got two extra weeks before my planned two month's away from home to do some more exploration. The file I/O pointer values that I found in the flasher code are correct. I have used them to dump Canon's firmware v1.1.0 successfully (from 0xFF810000 to 0xFFFFFFFF). It is not as straight as I thought. There were some more details I had to know about to actually dump the firmware without the risk of killing my XSi. so you were able to dump the rom content? That (rom dump) is affirmative. I started by dumping 0xFF800000 - 0xFFFFFFFF but then discovered that IDA isn't happy about 0xFFFFFFFF being used (used by IDA?) and that 0xFF800000 - 0xFF8100000 just contains 0xFF's. I ended up just dumping 0xFF810000 - 0xFFFFFFFC so that I don't have to change file size when loading it into IDA. I am too lazy even though one only has to do it once - the first time loading. 0xF8000000 - 0xFFFFFFFF is a huge chunk (128MB). Can IDA handle that? Or would it be more advantageous to dump it in separate smaller chunks. I know 0xF8000000 - 0xF800000F is used as boot_flags and I guess it is probably in non-volatile memory. How big it may be? Also what other regions that presents interesting stuff for porting. I have taken a snapshot of the source code and am able to compile it. But I have not looked into the code yet. By the way I think the next thing to do is to find the function pointers in the firmware to enable/disable boot-capability. I have followed the lead in a posting by Coutts (http://www.magiclantern.fm/forum/index.php?topic=1452.0) and found something close to the code (for 5D) in the posting but not quite the same. In 1000D (v1.0.5) I also found the same (XSi) code (in different places but very close by). Both of them are above 0xFFFF0000. I believe I have found them but until I learn ARM enough to be able to follow the code, I am not 100% sure. After this exercise I have a better grasp of this porting business. It is not very challenged per se if one has the right knowledge (ARM assembly language for me) but requires a ton of labor to find where those equivalent pointers are in XSi, for starter. There should be more things I don't know yet. use these ranges, they are the the real base address and repeat over and over until 0xFFFFFFFF. the processor uses the image at various addresses. on boot, 0xFFFF0000 is executed, which is at 0xF7FF0000. later it may jump to 0xFF810000 which really is 0xFF010000 etc. but when dumping, you best use the ranges i quoted above. Thanks for the information about ROM0 and ROM1. I read about them but have not put much thought into them yet. A couple of things to clarify though. About the memory ranges to dump. You mean to dump just the lower 16M (0xF0000000-0xF0FFFFFF for ROM0 and 0xF8000000-0xF8FFFFFF). Right? About the address mapping. I got lost here. How can 0xFFFF0000 (ROM1 range) be mapped from 0xF7FF0000 (ROM0 range)? yeah, i had a typo. Or 0xF8FF0000 maps to 0xFFFF0000. Anyway I went ahead to dump 0xF0000000-0xF0FFFFFF (16M) and 0xF8000000-0xF8FFFFFF (16M)ranges. The data from the 1st range (ROM0) are all 0's. I guess there isn't ROM0 in XSi (a blank ROM should be all 0xFF's). Data in the 2nd range seems to be two copies of the same code/data with an address offset of 8M. I got the impression when searching for a couple of specific patterns that matched once in my previous dump (0xFF810000-0xFFFFFFFF) and got two matches now. That probably means the size of ROM1 is 8M for XSi. Hmm, interesting. You can also cut a little bit off the end with a hex editor.. Its usually garbage like F's or 0s at the end. 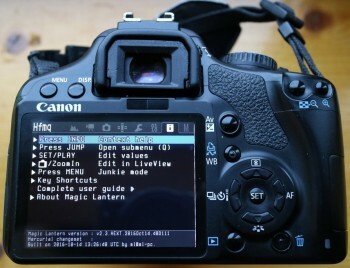 I'm also wondering about 400D.. would be nice to have dual ISO on that. By the way, the first 2K bytes (0xF8000000 and 0xF8800000 too) start with 8 0x00's and then all 0xFF's. So 0xF8000000, 0xF8000004, 0xF8000008 and 0xF800000C have value of 0, 0, -1 and -1. Seems to make sense. If you can write to it, it must be some kind of non-volatile memory to keep the flags across boot/power loss. its a flash chip. commands to erase/write are simple and standardized. Ah, good old flash chip. Must be serial type - pin count and size matter. I had dealt with them (both serial and parallel) before. I plan to convert my XSi into IR someday and will look for it when I open it up. Back to the porting thing, which model to pick as the base for XSi in your opinion? I poked around the ML source code trying to find some details about the boot_flag thing. And I found the bootDisk flag is @0xF8000004, not what I original thought @0xF8000000! Compare these sections of firmware code, I think I found the equivalent 500D enable/diable_bookDisk code in XSi. ROM:FF066754 ADR R0, aEnablefirmware ; "EnableFirmware"
ROM:FF066764 ADR R0, aDisablefirmwar ; "DisableFirmware"
ROM:FF066774 ADR R0, aEnablebootdisk ; "EnableBootDisk"
ROM:FF066784 ADR R0, aDisablebootdis ; "DisableBootDisk"
ROM:FF066794 ADR R0, aEnablemainfirm ; "EnableMainFirm"
ROM:FF0667A8 ADR R0, aDisablemainfir ; "DisableMainFirm"
ROM:FFD184A0 LDR R0, =aEnablefirmware ; "EnableFirmware"
ROM:FFD184B4 LDR R0, =aDisablefirmwar ; "DisableFirmware"
ROM:FFD184C4 LDR R0, =aEnablebootdisk ; "EnableBootDisk"
ROM:FFD184D4 LDR R0, =aDisablebootdis ; "DisableBootDisk"
ROM:FFD184E4 LDR R0, =aEnablemainfirm ; "EnableMainFirm"
ROM:FFD184F4 LDR R0, =aDisablemainfir ; "DisableMainFirm"
This similarity makes me think if 500D is a good candidate of reference for XSi porting even though these two models have different OS. Anyway, now is the time for ARM assembly language and architecture, and perhaps VxWorks. Until then, I don't think I can make any meaningful progress. I'm a 450d user (I use it mainly for astrophotography stuff) and ML would be a nice addon, I really wish to see it one day . I haven't moved to a newer canon model because this 450d is heavily modified (IR filter removed, peltier cooling), so I would like to stick with that camera at least for a while. I'm afraid I cannot help with the code because I don't know the internals of Canon firmware, and I don't have experience hacking the ML code, but I can offer myself to try to test any code you generate. I think it would be wise not to wait for a port but to use some advanced remote control device. Oh my, it isn't photoshopped? If not: good to see some people are not going along with planned obsolescence and try to make use of the good ol' gear! Having said that, I personally wouldn't go below the long-running 18mp sensor for general photography nowadays, there are so many cams around with it and ML support so they should be more than affordable... I just bought a used 7d1. That's b/c I had a 450d-class cam (Nikon 3100) for some weeks on loan and wouldn't want to touch that usability and sensor iq again even with a 10-foot pole. Can you post a link to this test build? I compiled a modern version of ML with the changes made by rufustfirefly. 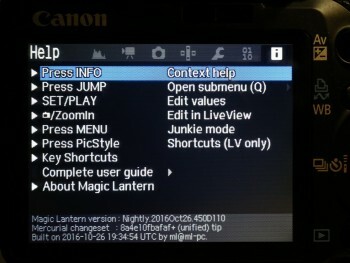 With GCC 4.8 or 4.9 I'm getting camera crash during font loading. Is it necessarily to use GCC 4.8.3 ? Added the 450D and 40D changes to the vxworks branch in the main repo. Did some minor cleanups (compiler warnings), had some attempts at emulating it in QEMU, but didn't really check any deeper yet. For reverse engineering, I've adapted the dm-spy-experiments branch as vxworks-dm-spy (tested in qemu).